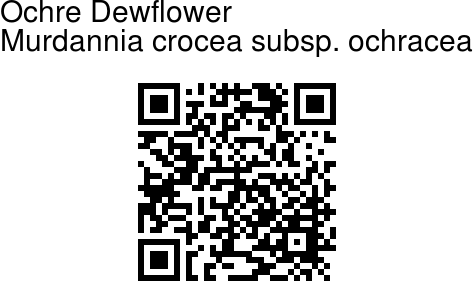 Ochre Dewflower is an erect or diffuse herb, up to 30 cm long, rooting at lower nodes. Leaves are 1.2-5 x 0.7-1.8 cm, ovate-oblong or lanceolate, base somewhat stem-clasping, tip pointed or nearly so, sheath up to 1 cm long. Flowers are borne in leaf axils, 1-4 together. Flower-stalks are up to 8 mm long, jointed below the middle. Sepals are 3, about 3 mm long, oblong. Petals are 3, brownish-yellow, ovate, blunt. Capsule is 3.5-5 x 2-2.5 mm, oblong, blunt. Seeds are angular, dark brown, rugose. 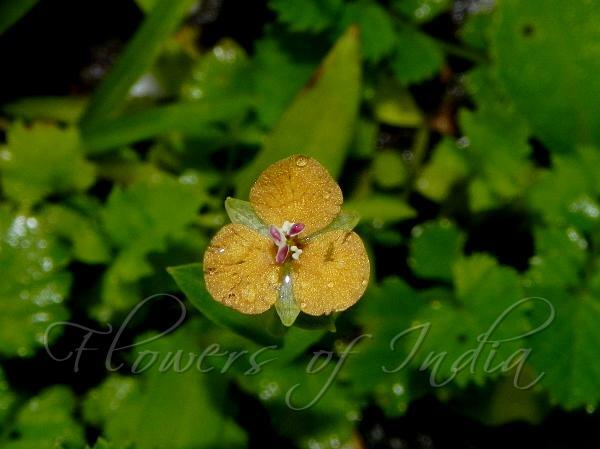 Ochre Dewflower is found in sandy marshy areas of Peninsular India. Flowering: August-September.